Cate Masters: Wonderful review for Surfacing! There is something about mermaids that tickles our imagination. Many of us loved the Ron Howard movie Splash when it came out in the 1980s, and the tale (and ‘toon) of The Little Mermaid has enchanted countless little girls. These mythical creatures resound with romance and whimsy, and if you're as fascinated by them as I am, then I’ve got a treat for you: Cate Masters’ novel Surfacing. This is a very well-written and involving story that features a young man who has lost his sense of direction in life but who regains his self-esteem, his family, and his future when he meets and falls in love with a mermaid. Ms. Masters’ writing style is smooth and effortless in Surfacing, providing a comfortable and enjoyable read. I found myself drawn to her characters and their world almost immediately, and within a few pages I became completely lost in the story. Not only are her characters well-rounded and believable, but so is the setting. Ms. Masters has a knack for well-executed yet understated emotion; I found watching AJ and his grandfather bond to be quite moving. 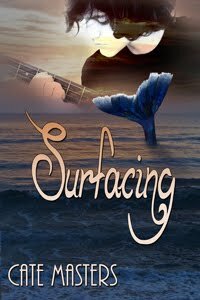 Surfacing is a delightful, entertaining, and touching read that will have readers rooting for the young hero and hoping that somehow fairytales can come true. This is more than a romance: it is a coming-of-age story that will linger in my memory. I truly enjoyed every page, and I think that if you decide to read it, you may as well." There's even more - you can read the full review here. A huge thank you, Bobby. You made my week! What a wonderful review, Cate. Based on the review, I'd say maybe someone should consider doing a screenplay...Keep turning out the wonderful stories!